Aren't they just beautiful? Cupcakes: food's miniature canvas. Recently my friend Esti - for whom I made Peanut Butter Cookies a while back - had her birthday. What to make? Why peanut butter cupcakes of course! This recipe came from allrecipes.com, another good resource. It was pretty simple to make and they all came out nice and golden brown looking. Next of course, came the decorating. First I frosted these, using half chocolate and half vanilla, so everyone could have their preference. (Esti's is vanilla). Then of course, came those lovely fondant decorations. I had some fondant that i died the pale blue you see here, then I took some of that and added a little more blue to make the darker shade, kneading it in so it was all even and not marbleized. 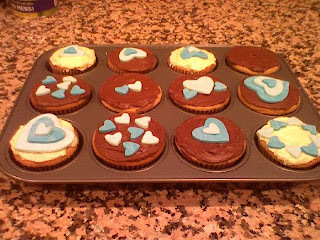 I cut out hearts in three different sizes, I have some fondant cutters but most cookie cutters will work as well, and arranged them in pretty patterns across the cupcakes. Voila! I know, I know, you're going to tell me that why bother to put the fondant on when you're going to take it off before you eat anyway. Well, I think it looks pretty. Ok? I knew you'd see it my way eventually. Tip of the Day: When frosting cupcakes without a piping bag, dollop some first in the middle and then use a flat edged knife to smooth it out in a circle motion. Fave quote of this post: "Cupcakes: food's miniature canvas." Oh no, oh yes, oh no.